and extreme resurgence of your goth phase. The goth phase: everyone knows it, most everyone goes through it, and some live to tell the tale (at least, that seems to be the popular understanding). Yet, in the scheme of the average American teenager, who likely entered and exited their goth phase at the tender age of twelve or thirteen, I went through a fairly late and fairly soft goth phase, never braving the crammed aisles of Hot Topic or having purple hair, heavily lined lids and braces at the same time (the former thankfully took place years prior). My staples were seemingly as inauthentic as could be, faux leather leggings purchased from American Apparel (RIP) and upside down cross necklaces and black leather creepers hesitantly purchased from Urban Outfitters one summer eve. It was a phase that was contained and a bit artificial in its nature, detached from the larger post-punk landscape that was likely brewing in my hometown's music scene at the time; lasting less than a year, it soon transitioned to an all-consuming obsession with minimalism by way of monochromatic basics and selective pieces of gold jewelry. That is, until the other day. It seems like this particular pair of shorts saw me before I saw them, symbolically beckoning me back to my high school goth phase by way of my local thrift store's dustiest corner. They felt a bit too out of place for my current sartorial fixings and a bit too long to hit a flattering point on my already slightly disproportionate body, but I tried them on anyway, perhaps out of genuine curiosity or perhaps out of a subconscious desire to replicate the authentic goth phase I never had. Ten dollars and two minutes of Hot Topic cash register small talk later, they were mine; after a bit of adjustments and fixings (see: raw hem and attempted tube top), they were truly mine. 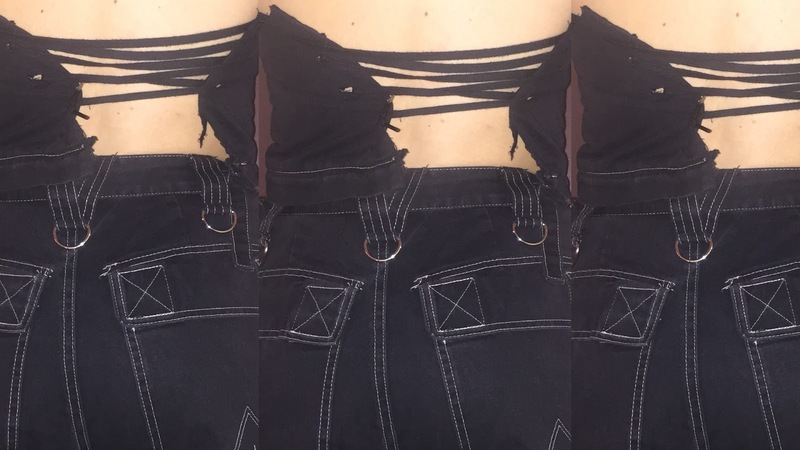 Of course, in the moment, I didn't realize how much of a gateway they would become, ushering in a reincarnation of my previous goth phase by way of a sudden fascination with grommet belts, netted fabrics and other so-called "goth" fixations. Though I never thought I would dip my toes back into these dark waters (and don't necessarily anticipate a particularly long dip), it is comforting to know that style phases don't always have to be confined to the clumsy years of adolescence. For, after all, what is style without experimentation?